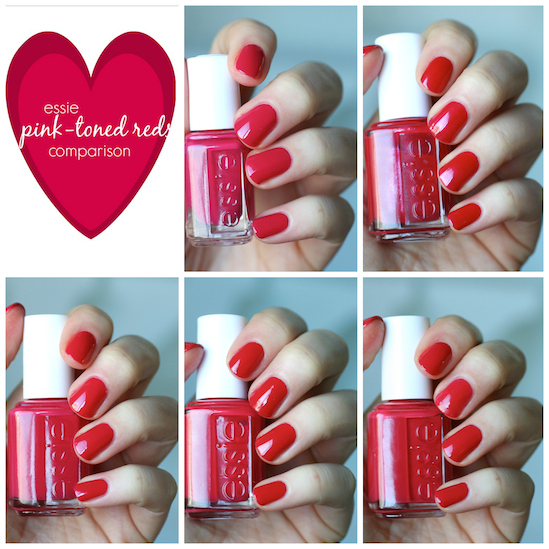 With Valentine's Day coming up, I thought I would theme out this week and bring you some comparisons of typical Valentine colours. Yup, I'm going with a red comparison today and a pink comparison on Friday. 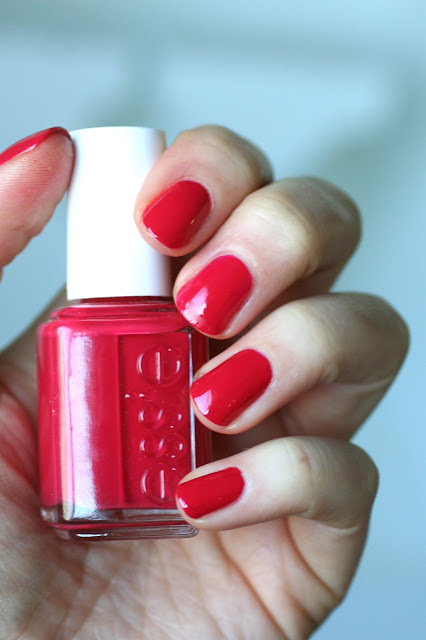 Looking at the side by side shots of my manicures above, it basically looks like I could have swatched ONE of the pink-toned reds and used the same photo for all of them! Haha. That would have definitely saved me some time ;). But no, I did not do that. Those are 5 completely different polishes I swatched for you. I swear. I've wanted to do this comparison for a loooooooong time. I look up at my Essie collection on the wall and see this long line of reds - pink-toned, orange-toned, dark reds and everything in between and out of them all, pink-toned reds are my favourite. Well, pink-reds AND deep berry reds. I'm not sure which has more of my affection. But this comparison totally proved to me that I really don't need more pink-toned reds in my life! Okay. Just looking at the bottle shots you KNOW there's dupes in there. Catwalk on the far left and Haute In the Heat on the far right are the only two that stand out as different. Catwalk has a fine shimmer running through it while Haute In the Heat actually leans more pink than the rest. Sitting at my kitchen table with all the natural light streaming in the windows, I can barely tell these nail polishes apart. Haute In the Heat is the only one that's looking different as its showing up more pink than the rest (or at least it should be. This photo doesn't capture it well, but it does look more pinkish than the rest). In this lighting I'm not even picking up on the shimmer in Catwalk and it looks the same as the other three reds. It's maybe slightly more red than the others, but just barely. I decided to head outside in full sun to see if I can tell any differences between them. Out in the sunlight, the shimmer in Catwalk is coming out and it's beautiful. It's also a tad bit more red like I saw in the indoor lighting. Haute In The Heat is more obviously different as a guava raspberry pink with reddish tones, whereas the others are red with pink tones (although, again, my camera had a hard time picking up that difference. Trust me, you can see it in real life). But even in the sunlight, Style Hunter, Double Breasted Jacket and Altitude Attitude are EXACTLY the same. I would say they are all dupes of each other. I actually came across this polish at the dollar store about a year ago. 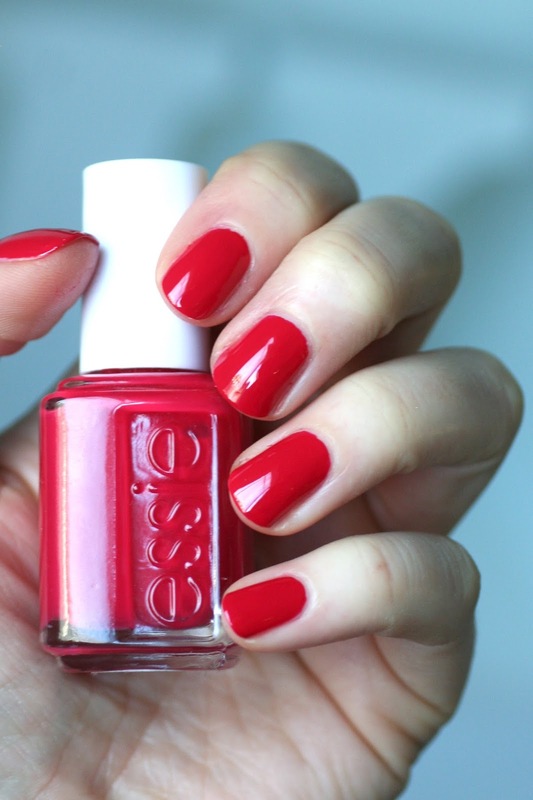 I hadn't ever heard of it, but an Essie that I could add to my collection for $3? Yup, I was all over that. I did a bit of research and found it came out in the Winter 2006 Collection. The formula is easy to apply and it's perfect in 2 creamy coats. Nice and self-leveling. The bottle has a fine silvery-pinky flash that made me think that it was going to have a strong shimmer on the nail, but it's very very subtle. You can only see it in direct sunlight. It's very pretty but it's more similar to the other pinky-red cremes than I thought it would be. I had to photograph this one in direct sunlight so you could see that subtle fine shimmer. It's not super obvious but it gives this polish depth. I don't think I've ever actually worn this polish but I like this a lot! 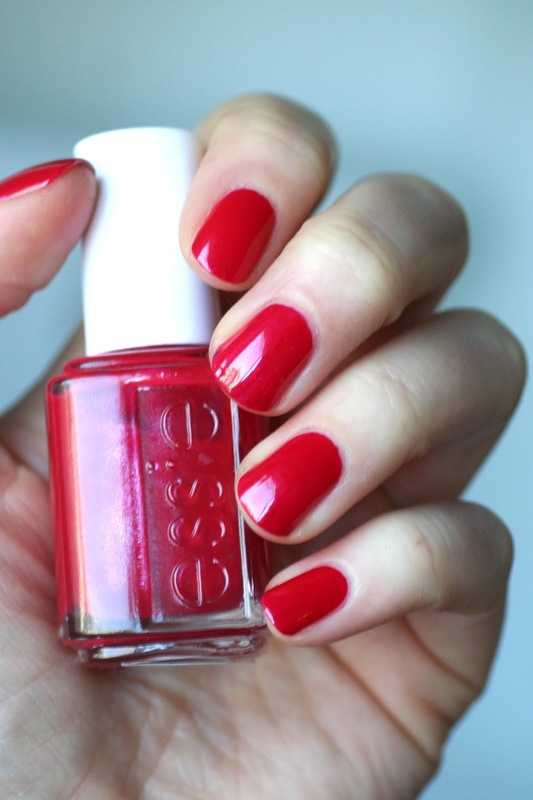 I'll definitely keep this one in mind the next time I want a red mani. This one is the most recent addition to my collection since it came out in the Winter 2015 Virgin Snow Collection. To be honest, I almost didn't order it because I knew I had enough pinky reds. 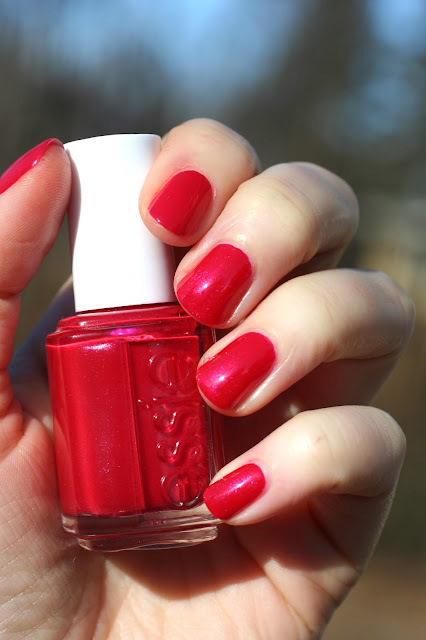 In the end, I decided to get it anyway since I could provide you guys with swatches for how it compares to other Essie reds and crossed my fingers that it would be different enough to justify. But no. It's the same exact colour as Double Breasted Jacket and Style Hunter. The formula is really nice and opaque. It's basically good in one coat but I could still slightly see my nail line so I added a second coat. At this point, I'll just apologize for sounding like a broken record, because all these reds have pretty much the same formula! The formula is creamy and opaque, nice and self-leveling and opaque in two coats. This one is maybe a bit more of a "crelly" formula (creme/jelly hybrid) but it's still very opaque. It's really not noticeable though and I could hardly tell as I swatched all 5 of these back to back. 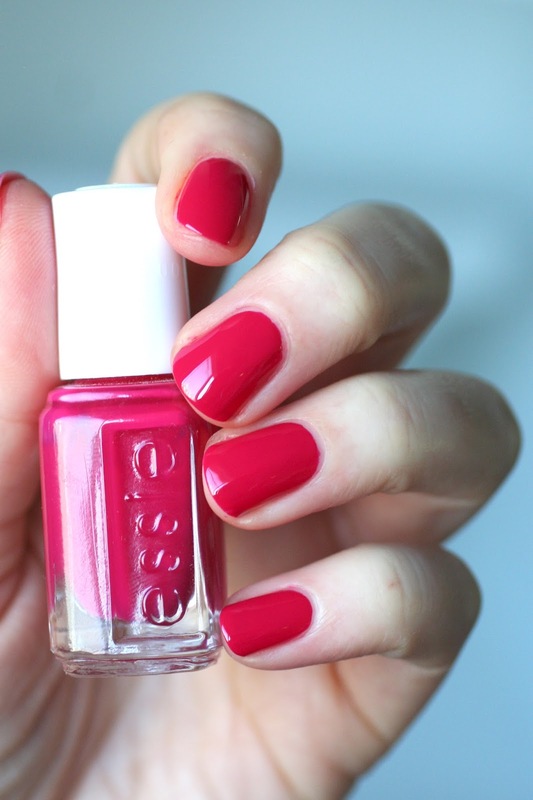 This was my first Essie pink-toned red and has been my favourite ever since. I checked and the polish is already half-way down that first 'e' on the bottle. That's significant when you have a collection like mine! It came out in the Spring 2014 Collection called Hide & Go Chic. I freaking loved that collection. Haute in the Heat came out right after Style Hunter in the 2014 Summer Collection. Essie calls this colour "hot guava raspberry" and like I said earlier, it's the only one that is significantly different from the rest in this group. Essie does an amazing job of reds, so it's no surprise that this formula is just as easy to apply as the others. It's beautiful in 2 coats. I will say if you go back up to the photo where I have all 5 shades swatched on the same hand, my thumb has 2 coats of Haute In the Heat on it and you can very faintly see the nail line. I think that's because this polish has a bit of a crelly formula as well. I actually couldn't see that nail line in person, it was just my macro lens that caught it up close in the sunlight. 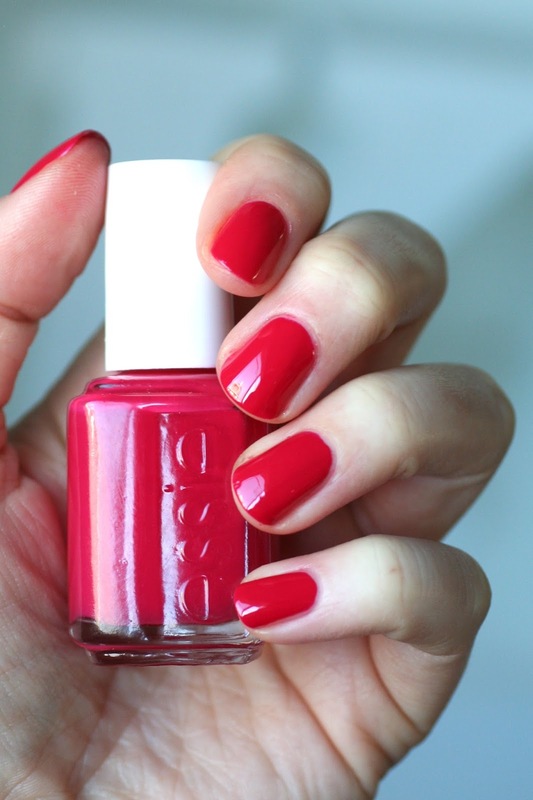 Essie was having a pink-toned red year in 2014! First Style Hunter in Spring, then Haute in the Heat in Summer and then this one called Double Breasted Jacket in the Winter Collection. I was sooooo excited to find this one on a clearance shelf last summer but had I known it was going to be a shade I already had multiple bottles of, I would have passed. The formula is slightly different from Style Hunter (but not by much) since Style Hunter is a crelly, but it is EXACTLY the same as Altitude Attitude. They are both creamy, opaque and easy to apply. There's a very faint nail line after 1 coat so I did 2 coats. That's my first time doing a comparison like this, where the polishes are so similar they dupe each other! My favourites are Haute In the Heat and Style Hunter. Haute In the Heat is actually a different colour and Style Hunter has sentimental meaning for me. That's my pick but you could literally choose any one of the other reds and get the same result. Because colour and formula-wise, they are pretty much the same. Thank you for taking the time to do this type of post. Honestly, its overwhelming to decide standing in front of the display. Would you believe that making a list that is kept in my purse makes it easier for me? You just never know when you will need a reference. That's a lot of red! But thanks for doing this comparison, do you by any chance have Watermelon? I'm assuming it closer to Haute in the Heat than any of the other ones? Thanks for the comparison! It's always nice to see them side by side. Yes Mrs W, I was going to ask about Watermelon too? Great post Kindra, I know how difficult it is for a camera to pick up the subtleties of reds (I often have to correct them in photoshop to be more accurate). No I don't have it yet Mrs W! On my wishlist though ;). I would guess closer to Haute In the Heat as well, since I think it is more pink. I was thinking of getting it last year when Brides No Grooms came out. Yes reds are hard Emma! I have a dream to search allllllll my reds and do a ridiculously huge comparison but I don't think it's possible with my current set up. I have to do a bit of editing as well and it can still be frustrating when your camera doesn't pick up what your eye sees. No watermelon because I don't own it yet! I'm thinking it's more on the pink side though. Just a guess. That's really too bad about Altitude Attitude. So so disappointing when a polish does that. I was obsessed with the color of Smokin Hot and the first few times I wore it, I chipped in the first 12 hours. I gave it another shot with a different base coat and had great success. Hopefully that will work for you :). Didn't think of that! although I found that my usual base coat (Essie's Grow Stronger) is usually very good with "sticking" my polishes to the nail (especially Essies, I'm guessing formula compatibility here). Any good base coat recommendations? Emma, I saw this nail hack on YouTube from a lady named Stacy her channel is PolishedWays and she said to put base coat down, 2 coats of color, base coat, then top coat and it gives you at least 5 days chip-free. I haven't tried it yet but I made my friend watch this video and she tried it and got 4 days without chips. I'm so all over the place with base coats and use a bunch of different ones. I have nails that peel, so no polish stays on me for very long. For base coats treatments I'm really like Nailtiques Formula 2. I really like Essie Ridge Filling Base or Fill the Gap for lighter or streaky polishes. It totally helps everything smooth out and go on much nicer. But I haven't found an Essie base coat that just prolonged the wear time of my polish. I tried Formula X Base coat from s friend once and got like 5 or 6 days wear time with no chips and that's UNHEARD OF for my nails! So I think I'm going to order that soon!